Weldenia candida is an unusual, tuberous-rooted species found in the high mountains of Guatemala and Mexico. It is the only species in the genus, and was first described in 1829 and named in honour of Baron Ludwig von Welden (1780-1853), a Master of Ordnance in the Austrian army. Weldenia candida first came to the Royal Botanic Gardens, Kew from Guatemala, where it was collected in the crater of the Volcan de Agua. 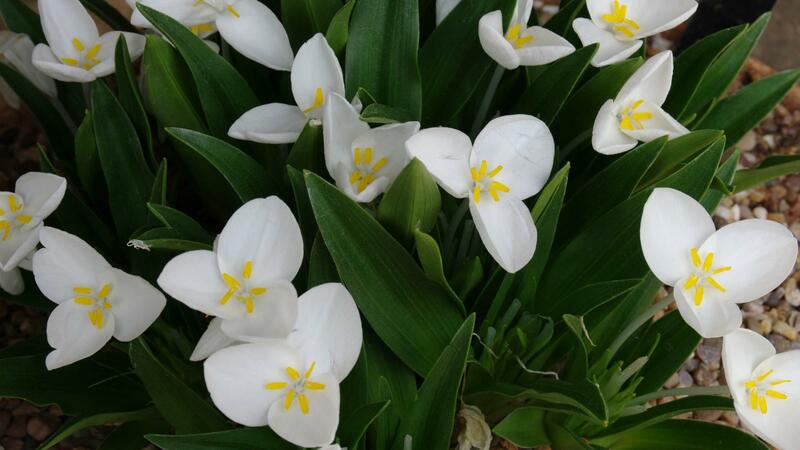 Weldenia candida grows naturally on volcanic slopes and craters, and was first introduced to cultivation in 1893. Weldenia candida is native to the high mountains of Mexico and Guatemala. The linear-lanceolate (the shape of a lance, much longer than wide) leaves are only a few centimetres long when the plant is flowering, but can subsequently elongate to over 20 cm. They may be glabrous (hairless) but are often hairy, particularly on their undersides. Small tufts of whitish hairs are sometimes borne on the upper leaf surface, particularly in the Guatemalan forms. The inflorescence (flower cluster) is a compacted cyme (a flower cluster in which the central flowers open first) at the centre of the rosette of leaves. The three-petalled flowers have a distinctive, long corolla (petal) tube, 4.0-6.5 cm long. The petal lobes are 1-2 cm long, so that each of the delicate white flowers can reach 4 cm wide. Individual flowers last only a day but are produced in succession over several weeks in late spring. Weldenia candida is cultivated as an ornamental. 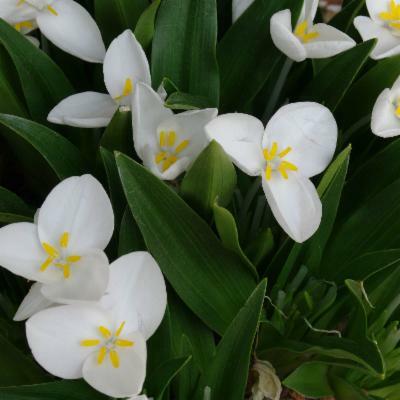 Weldenia candida can be grown in the open garden in a raised bed or sunny border, but it is generally advisable to protect it from penetrating frosts and winter rainfall by keeping it in deep pots in a sunny and well-ventilated cold frame or cool glasshouse. This plant dies down for the winter and new growth will not appear until early spring. Seed is hardly ever set in cultivation, as it seems that two clones are needed to enable cross pollination. Division in early spring is possible but the mass of tuberous roots can be difficult to part. The soil must be washed away from the roots so that individual growing points can be carefully teased apart, a process that inevitably breaks some of the roots. Root cuttings can be taken in autumn. Another method of propagation is to take side shoots as basal cuttings in summer. Weldenia candida can be seen on display in the Davies Alpine House in late May and growing in the Rock Garden and the Woodland Garden at Kew. Pressed and dried specimens of Weldenia are held in Kew's Herbarium, where they are available to researchers, by appointment. The details, including images, of these can be seen on-line in the Herbarium Catalogue. The first examples were introduced into cultivation in Britain in 1893. Weldenia candida arrived at the Royal Botanic Gardens, Kew from Guatemala, where it was collected in the crater of a volcano. In May 2000, a large-flowered Mexican form was exhibited at the Chelsea Flower Show by Kew, and was awarded a First Class Certificate. Volcanic slopes and craters, in alpine meadows, and in clearings in pine forest, at altitudes of 2,400 to 4,000m. Rugendasia majalis Ehrenb. ex Hook.f. Hunt, D.R. (1994). 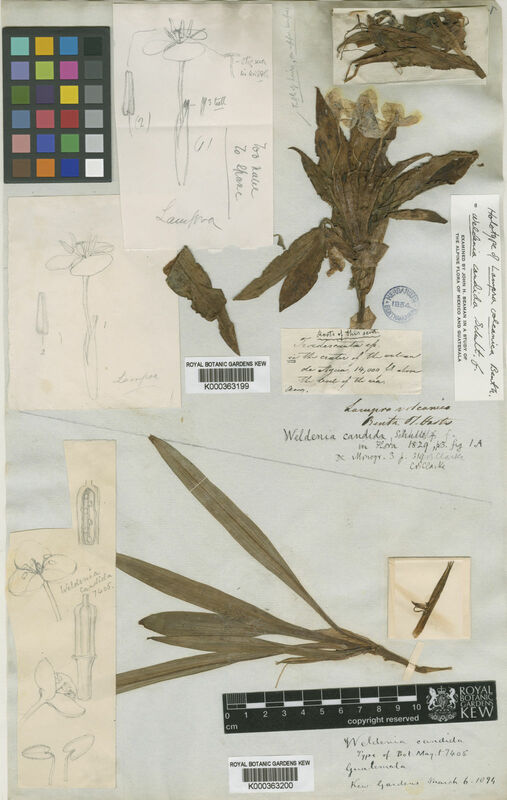 Weldenia Schultes f. In Davidse G. et al (eds.) Flora Mesoamerica 6: 159. Universidad Nacional Autónoma de Mexico. Bacon, L.J. (1981). Weldenia candida. Quarterly Bulletin of the Alpine Garden Society 49: 70—73.